Local volunteer organisation Chronically Fabulous is to record a song whose singers will all be chronically ill and disabled people from Northern Ireland. Chronically Fabulous is a relatively new organisation, based in Ballinderry, made up of a team of professional makeup artists, photographers and stylists who offer free makeovers and photoshoots to chronically ill and disabled people. The idea for recording a track came after Anna Murphy of Ballinderry Upper who attended a Chronically Fabulous day and wrote a song inspired by a poem Debbie Deboo, the co-founder of Chronically Fabulous, wrote. Anna played it for the team and they loved it. “Debbie had told me about her exciting project,Chronically Fabulous,” explained Anna. “I liked her idea to give people living with Chronic conditions a day out with pampering, a makeover and great photos to take home. “The reports back from people who had been on the first shoots were full of praise and enthusiasm after their day out. They had obviously had a great lift and looked fantastic in the photos. “I began to write a song to add to the feel good factor of the project. This was helped on its way when I read a great poem Debbie had written and it was the inspiration behind the finished song. Three solo artists will be the front singers and there will be a backing choir. 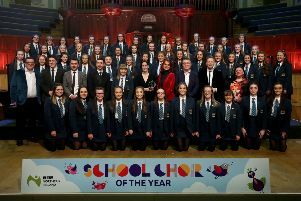 Anna, herself a musician, is one of the singers, Tracy McConnell of Armagh and Connie Barenskie, who is also from Armagh, won an online competition to be the third soloist. The record launch and fundraiser will be held at Crafty Belfast at the Maple Leaf in Belfast on June 24. Lady Portia Di Monte will be hosting and the entertainment on the night includes music from The Twisted Sisters, The Belfast Blues Brothers and Siobhan Day. Performance poetry from Colin Hassard and Elizabeth McGeown and a disco from DJ Aaron Anderson Cardwell. Tickets can be bought via the facebook page at www.facebook.com/chronicallyfabulousNI.